In the military, Ty Pinkins served in 23 countries, including three combat tours, receiving the Bronze Star Medal. The road from the Mississippi Delta to Washington, D.C., is about 1,000 miles. For Ty Pinkins (L’20), the journey took nearly 40 years. 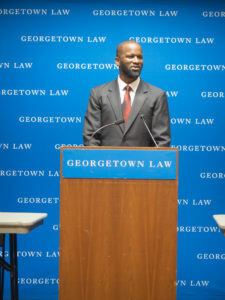 Now, through a nonprofit he founded before coming to Georgetown Law, Pinkins is working to give underserved teens a chance to see their government at work, and to realize that they can be part of that process. Pinkins, 44, grew up in rural Rolling Fork, Mississippi. Starting at age 14, his summer job was chopping cotton, “walking the fields with a hoe, sun-up to sun-down,” he says. He enrolled in Tougaloo College in Jackson, Mississippi, about 60 miles from Rolling Fork. He did well there, “but by my third year I wanted to do something different, so I joined the military,” he says. It turned into a 21-year career. Pinkins served in 23 countries, including three combat tours, and received the Bronze Star Medal and a raft of other honors. He also received his undergraduate degree, in 2012, thanks to University of Maryland University College courses at military bases “on four different continents,” he says. And the following year, he was transferred from Okinawa to Washington, D.C. He was part of the White House Communications Agency’s “24/7” team, which manages and secures the telecommunications systems used by the president and other top-level agencies and personnel. It was his last posting: he retired from the military in June 2017, and started at Georgetown Law that August. He laughs when he remembers his farewell conversation with President Barack Obama. It was in Washington, Pinkins says, that he started giving serious thought to his post-military plans. “I wanted to do three things: go to law school, give back to the Delta community and eventually, go into politics,” he says. Giving back came first. He formed his nonprofit, the Pyramid Project, in 2016. “I thought about a pyramid, because my goal is to build youth from the ground up; to give them a strong base before they go out into society,” he said. The nonprofit offers teens, primarily from the Delta, a week-long immersion in the nation’s capital. For many, it is their first trip away from home. They meet their elected officials as well as successful professionals in business and academia, most of whom are also from underserved communities. The students are given responsibilities, like figuring out how to get to appointments, in order to build self-reliance and leadership skills. By the end of the trip, they are “infected” with possibilities, Pinkins says. In its first two years, the program has hosted more than 100 students. Some have already returned to Washington — for college. “We have helped move students into Howard University and the Georgetown main campus,” he says. 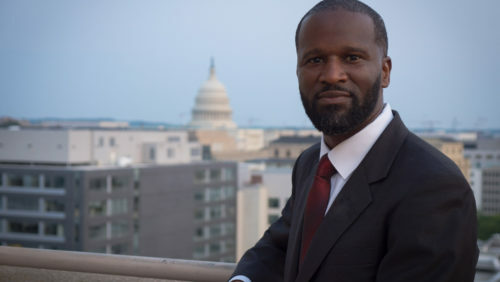 This semester, he completed “Campaigning for Public Office,” a new simulation course taught by Professor Alicia Plerhoples and Adjunct Professor Zakiya Thomas, which should help with his long-range goal: representing the Rolling Fork district in Congress. First, though, Pinkins wants to add an LL.M. and, perhaps, a degree in public administration. After that, he will spend a few years building up the Pyramid Project and developing additional programs, including an international option. While that’s not a bad strategy — it could help build his own base and his “brand” for a future run — Pinkins’ focus on his nonprofit is far more visceral.